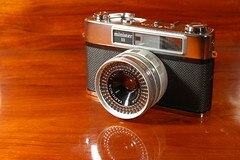 The Yashica Minister III was introduced in 1963, and like many cameras of the time, the meter's sensor is mounted inside the filter connection ring. 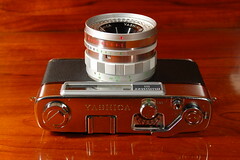 It has a coupled rangefinder. In 1964, the Minister III was replaced by the Minister D, which had a CdS meter cell.